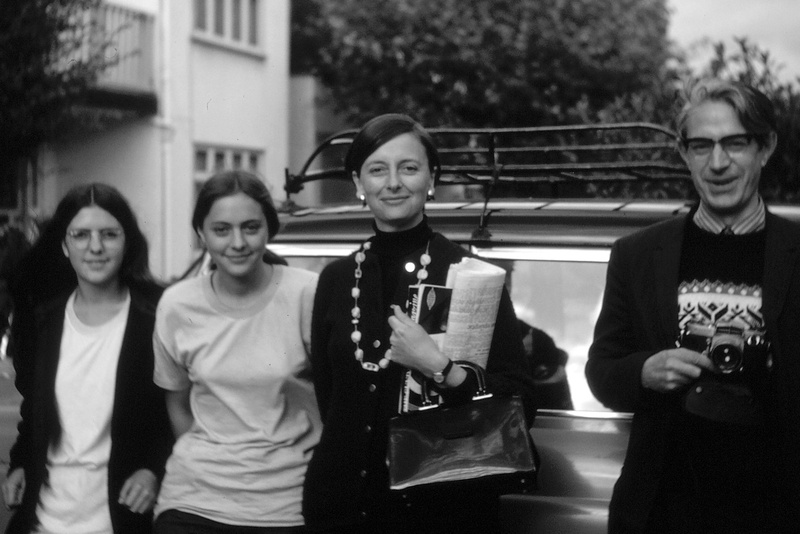 My sister, me, my mother, and my father in a photo taken by our family friend and Cambridge don, Mike Bown when I was fourteen. My dad was a man of few words; a brilliant scientist and professor, but in his own head most of the time, thinking about science and his own specialties: geophysics, mineralogy, and the origins of the earth. At the dinner table, he would be in and out of the general conversation, but always a couple of paragraphs behind, so when he said something it was rarely on the subject under discussion. A couple of months before he died, I asked him about his maternal grandfather, about whom we knew very little. I was hoping for a physical description, his likes and dislikes, what he’d done in life. My father must know quite a lot about him, I reasoned; his grandfather had moved in with my father’s family and lived with them until his death. Surely he’d have something to say about him? “He was quiet,” my father finally said. I prodded him for more information, but there was nothing more he could think to say. I always wanted to understand the workings of my father’s mind, and I tried my best while he was with us, but now that he’s gone, I have a huge hunger to learn more about him. He provided very little information unless it involved science. Ask me about glaciers and kettle moraines, limestone domes and gritstone edges and the theory of the hot moon and I can tell you; anything else, and it’s a black hole. On the surface, my dad and I didn’t have much in common. He was a scientist, I’m a humanist; he hid his feelings, I live on mine; his interest was the future, I dwell in the past; he was not the slightest bit sentimental, I am frequently knocked silly with sentiment. But we both love haymaking and reading and going on walks, and we value honesty and taking care of family and, as I discovered today, in a huge coincidence, we both ended up on the same spot, forty years apart at, as it turned out, the beginning and end of an era, in the company of the very same person, and thinking the exact same thing. This morning I needed to go into the center of Cambridge. I drove in with Mike Bown who, if you’ve been reading this blog, you will know is a don of Clare College, an old family friend of my parents from Mike’s and my dad’s time at the Cavendish Laboratory, and our neighbor-across-the-street who kept us afloat during the first month we were here and still continues to do so. We parked in the Clare car park off Queen’s Road, and he left me to do some work in his office before going to lunch at Clare while I walked in the direction of the colleges and the center of town to do my errands. After crossing Queen’s Road, I took in a view of what I believe is one of the most glorious buildings ever built: King’s College Chapel, whose foundation stone was laid in 1446 in the reign of Henry VI and which was completed in 1547 under the reign of Henry VIII. The Chapel, called “a splendid example of late Gothic (Perpendicular) architecture,” has the largest fan vault ceiling in the world, a Renaisssance wooden screen, and some of the finest medieval stained glass. 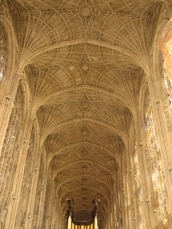 It also has some of the most beautiful singing I’ve ever heard done by the King’s College choirboys. Listen to some of their CDs of the Christmas service and you’ll see what I mean. I had just crossed Queen’s Road, on the other side of the river from the colleges, when I saw a great deal of activity in the long swath of land comprised of trees and grass and, as I had seen several weeks ago, a clump of snowdrops. 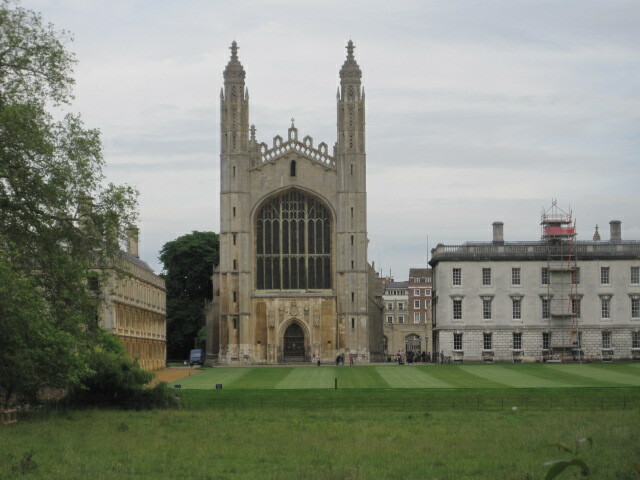 A view of King’s College Chapel from the far side of the Cam. Unlike all the other grassy areas or gardens around the colleges, this particular swath of land isn’t particularly pleasant: buses line up all along Queen’s Road to drop off their loads of tourists, and the trees, rather spindly things, are placed in unimaginative lines, as if they had been planted by the Forestry Commission rather than a landscape architect who had an appreciation for their natural beauty and their propinquity to King’s College. 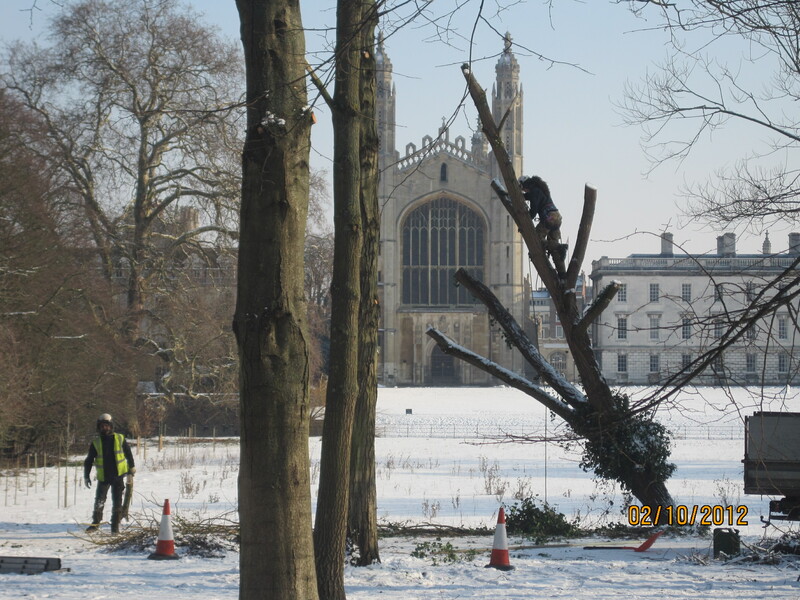 There were about six men working on the trees, and not just working on them, but stripping all the branches off them so that they now looked like the denuded masts of ships. 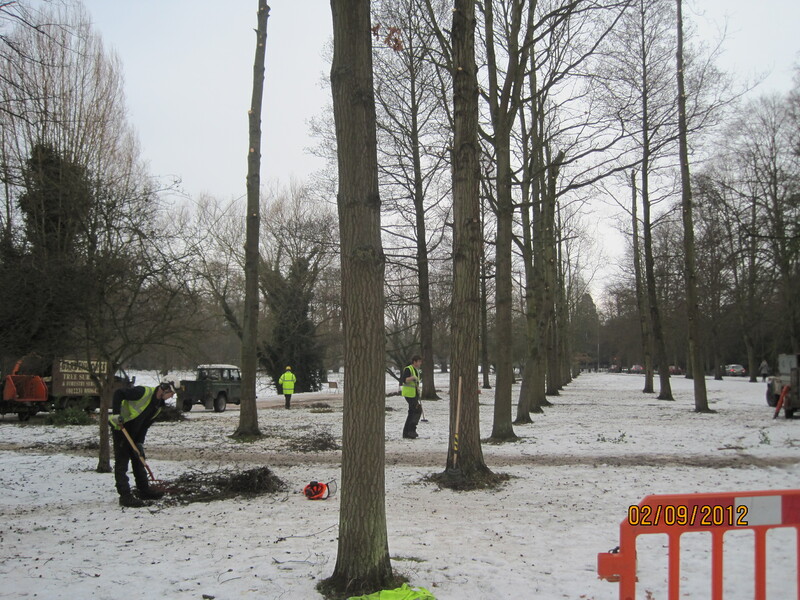 I asked the man who appeared to be in charge what was going on, and he told me that they were cutting down the alder trees which, he said, were long overdue for being cut down. They would be planting oaks, and staggering them so they wouldn’t be in straight lines, which made eminent sense to me. As far as I’m concerned, trees should only be planted in rows if they border majestic avenues or are destined to be logged, neither of which was applicable here. A line of trees across the river from King’s. “I’m his daughter,” I said, delighted to meet someone who had known my father. “Right here?” This was amazing; my father had spent almost all of his adult life in America and although we came back to England every summer, he spent no more than two or three days a year in Cambridge. A feeling of pleasure rose up in me. My father had been here, right on this spot where I was now, watching the young trees be planted, as I was now watching them be cut down, and Mike Bown had been with him then, as he was with me now. Just what I’d been thinking. The next day I saw the men from the tree surgery company still working on the trees, and I went to see the man in charge and told him the story about my father being here forty years ago to witness the trees being planted and how I was here now witnessing the trees being cut down, and how my father had said that the trees shouldn’t be planted in straight rows. That is the most beautiful story. Thanks. It made me feel so incredibly close to my dad, a man of few words, as I have said.